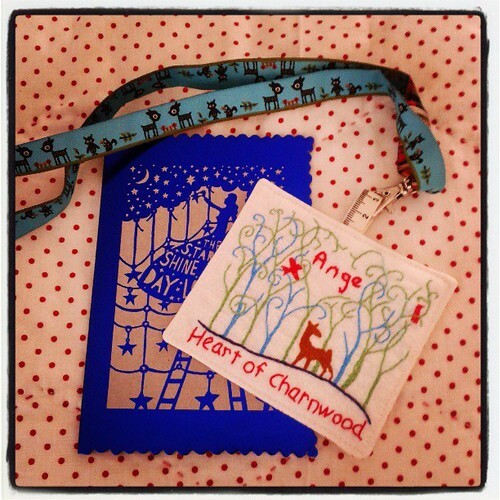 HEART OF CHARNWOOD: It's All A Bit More Real Today. I'm going to the Fat Quarterly Retreat in London in less than 4 weeks time. I've always been going, since I missed last years but today, it all became a little more real. I am known for being a bit slow on the uptake sometime (be nice ladies), so when a little parcel from the lovely Helen at Indianna Dreams dropped through my postbox, I couldn't for the life of me figure out why she would be sending me another package. I say another because we were in a swap together a few months, back, and she made me this fan-bloody-tastic pouch and needlebook, which I love, love, love! And then it occurred to me (slowly) that it must be my Retreat Name Tag! And here it is, in all it's glory. Thx so much Helen, looking forward to thanking you in person! It is absolutely gorgeous Ange - a beautiful name badge. And what a pouch to go with it! Lucky lady!! Wow! Is that all embroidered? If so she must have teeny tiny fingers - it's so intricate! A 2-in-1 name tag - fab! Love the embroidery. Will know who you are at FQR now! How awesome that you get to go to the FQ retreat!! And sporting a sweet name tag! Such a gorgeous name-tag. Can't wait to see all that teeny-tiny embroidery up close! The name tag is lovely, the excitement and anticipation seem to be building..!! What a truly super name tag - wouldn't it be great if all name-tags could be as good looking as this? Ooooh less than a month to go.....exited too! I love your name tag, and I best start getting organized, as you are right about how soon we will be at the retreat. Love the mail you get! I leave in 12 days! Talk about panic. Yikes! Your name tag is really perfect. Someday I am going to go to that retreat! We want to visit England and I could plan our trip to coincide, eh?